Last year, I started working my way through a short row book, and I have enjoyed every single pattern made out of it so far. 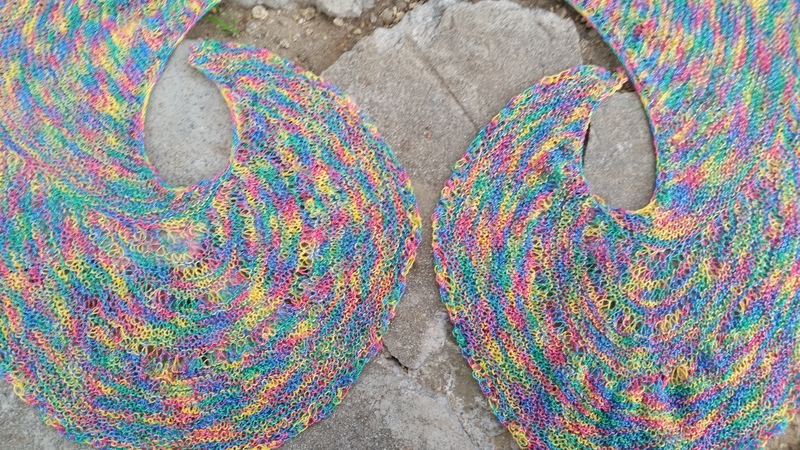 I wondered about the shawl shape when I was making it, and when I put it on, it all made sense. 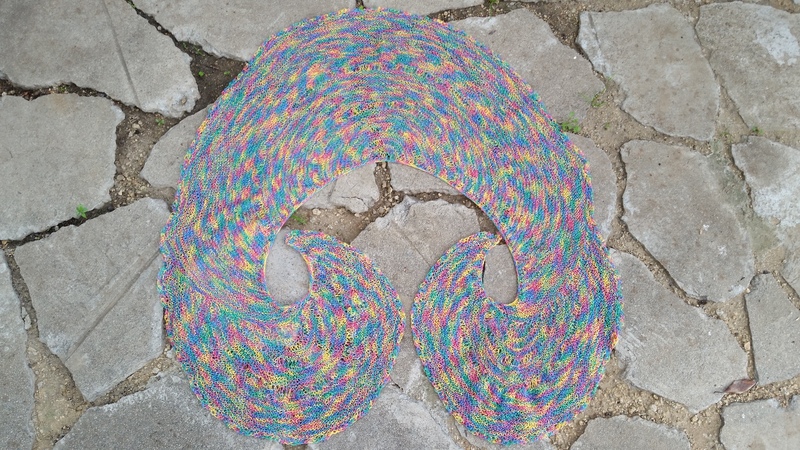 However, I am not sure how to feel about the results of this particular shawl because the yarn didn’t knit the way I expected. 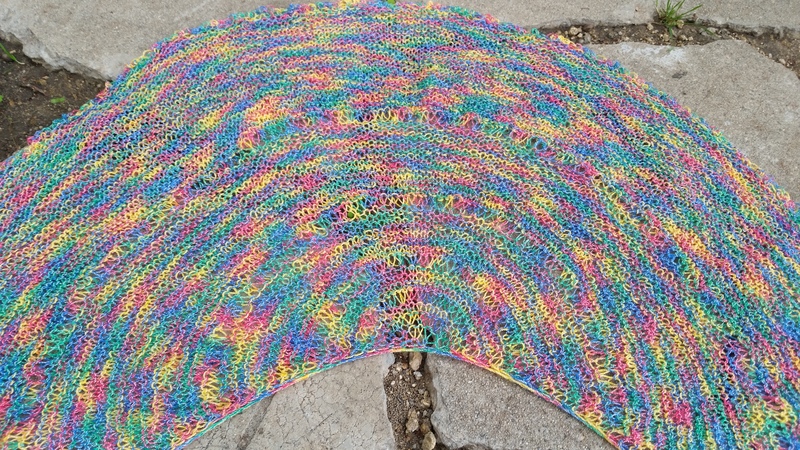 The shawl pattern was alot of fun, and as you can see, it drapes beautifully. Despite the vibrant yarn ball, the lack of a dominant color makes it all “gray out”… wearing the rainbow is the new gray? But as you can also see in the flat photos, the colors are not exciting. This yarn was given to me and has been in my stash for a long time. It is very vibrant in the ball, but knit up, is not that exciting. I think this is a classic case of the colors muddying up because of not having any one dominant shade. I am thinking I will probably just treat this shawl as a gray shawl and wear it the way I would wear a gray accessory. 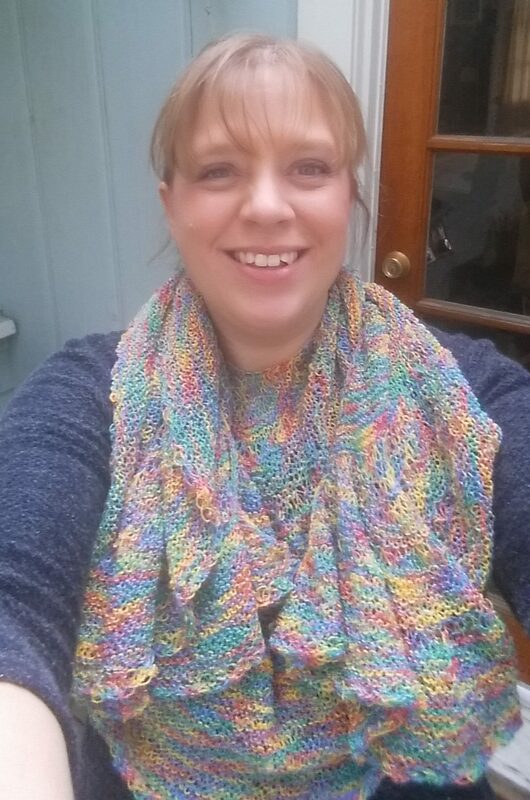 I’d like to make it again in a different yarn because the pattern was so fun, and just being honest, I don’t feel like I did it justice. But, I am curious to know what you all think – do you love it or hate it? It’s a very nice shape. When I first saw it in the smaller photos, I saw “babyish” colors full of pink, blue and yellow. It does look kind of grayish. However, when I clicked on your picture and saw the large photo, it was an explosion of color and is absolutely gorgeous! You definitely did the shawl justice. I think I know what you mean, but it’s very pretty for wearing with a plain coloured top. The colors are not working for me. Because ALL the colors are bright, and in the ball equally, it ends up looking like something made for a child. But, as usual, your knitting is beautiful.